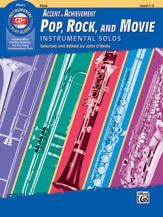 Based on the widely used Accent on Achievement band method, Accent on Achievement Pop, Rock, and Movie Instrumental Solos offers a versatile selection of music for flute, clarinet, alto sax, tenor sax, trumpet, horn in F, and trombone. Carefully selected and edited by AOA author John O'Reilly, each book contains arrangements appropriate to each instrument and correlated to Books 1 and 2 of the method. The CD includes a fully orchestrated demo track of each song, which features a live instrumental solo performance, followed by a play-along track. Also included are PDFs of piano accompaniments, and Alfred's Tempo Changer Software.